THIS COMBO COMES FULLY TESTED AND INCLUDES. 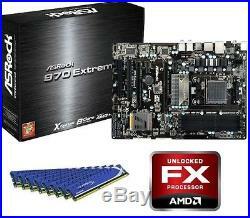 ASROCK 970 EXTREME3 ATX. AMD FX-4100 QUAD CORE CPU PROCESSOR. APPROVED COOLING FAN FOR AMD PROCESSORS. 8GB (2X4GB) OF DUAL CHANNEL 1600MHZ DDR3 MEMORY. Support for Socket AM3+ processors – Support for Socket AM3 processors: AMD Phenom II X6 / X4 / X3 / X2 (except 920 / 940) / Athlon II X4 / X3 / X2 / Sempron processors – Supports 8-Core CPU – Supports UCC feature (Unlock CPU Core) – Digi Power Design – 4 + 1 Power Phase Design – Supports CPU up to 140W – Supports AMD’s Cool’n’ Quiet Technology – FSB 2400 MHz (4.8 GT/s) – Supports Untied Overclocking Technology – Supports Hyper-Transport 3.0 (HT 3.0) Technology. Northbridge: AMD 970 – Southbridge: AMD SB950. Dual Channel DDR3 memory technology – 4 x DDR3 DIMM slots – Supports DDR3 2100(OC)/1866 /1800 /1600 /1333/1066/800 non-ECC, un-buffered memory – Max. Capacity of system memory: 32GB. 32Mb AMI UEFI Legal BIOS with GUI support – Supports “Plug and Play” – ACPI 1.1 Compliance Wake Up Events – Supports jumperfree – SMBIOS 2.3.1 Support – CPU, VCCM, NB, SB Voltage Multi-adjustment. Audio, Video and Networking. 7.1 CH HD Audio with Content Protection (Realtek ALC892 Audio Codec) – Premium Blu-ray audio support – Supports THX TruStudio. PCIE x1 Gigabit LAN 10/100/1000 Mb/s – Realtek RTL8111E – Supports Wake-On-LAN – Supports LAN Cable Detection – Supports Energy Efficient Ethernet 802.3az – Supports PXE. 5 x SATA3 6.0 Gb/s connectors, support RAID (RAID 0, RAID 1, RAID 5 and RAID 10), NCQ, AHCI and “Hot Plug” functions. 2 x USB 3.0 ports by Etron EJ168A, support USB 1.0/2.0/3.0 up to 5Gb/s. 5 x SATA3 6.0 Gb/s connectors – 1 x IR header – 1 x CIR header – 1 x COM port header – 1 x HDMI_SPDIF header – 1 x Power LED header – CPU/Chassis/Power FAN connector – 24 pin ATX power connector – 8 pin 12V power connector – Front panel audio connector – 3 x USB 2.0 headers (support 6 USB 2.0 ports). I/O Panel – 1 x PS/2 Mouse Port – 1 x PS/2 Keyboard Port – 1 x Coaxial SPDIF Out Port – 1 x Optical SPDIF Out Port – 4 x Ready-to-Use USB 2.0 Ports – 1 x eSATA3 Connector – 2 x Ready-to-Use USB 3.0 Ports – 1 x RJ-45 LAN Port with LED (ACT/LINK LED and SPEED LED) – HD Audio Jack: Side Speaker / Rear Speaker / Central / Bass / Line in / Front Speaker / Microphone. Other Features / Miscellaneous. ASRock Extreme Tuning Utility (AXTU) – ASRock Instant Boot – ASRock Instant Flash – ASRock APP Charger – ASRock SmartView – ASRock XFast USB – ASRock XFast LAN – ASRock XFast RAM – ASRock On/Off Play Technology – Hybrid Booster: – CPU Frequency Stepless Control – ASRock U-COP – Boot Failure Guard B. Drivers, Utilities, AntiVirus Software (Trial Version), CyberLink MediaEspresso 6.5 Trial, AMD OverDrive Utility, AMD Fusion, AMD Fusion Media Explorer, ASRock Software Suite (CyberLink DVD Suite – OEM and Trial; ASRock MAGIX Multimedia Suite – OEM). Quick Installation Guide, Support CD, I/O Shield – 2 x SATA Data Cables. CPU Temperature Sensing – Chassis Temperature Sensing – CPU/Chassis/Power Fan Tachometer – CPU/Chassis Quiet Fan – CPU/Chassis Fan Multi-Speed Control – Voltage Monitoring: +12V, +5V, +3.3V, Vcore. ATX Form Factor: 12.0-in x 8.6-in, 30.5 cm x 21.8 cm – All Solid Capacitor design (100% Japan-made high-quality Conductive Polymer Capacitors). 7 / 7 64-bit / Vista / Vista 64-bit / XP / XP 64-bit compliant. FCC, CE, WHQL – ErP/EuP Ready (ErP/EuP ready power supply is required). DUAL CHANNEL MEMORY DDR3 MEMORY. 8 GB (2X4GB) 240 pin, PC3-12800 1600 MHz DDR3 SDRAM. 240pin, Non-ECC, Un-buffered DDR3 SDRAM DIMM. 6 Layers Ultra Low Noises Shielded PCB 1.5V Power Supply. AMD FX-4100 QUAD CORE X4 3.6-3.8GHz CPU PROCESSOR. 32NM 95W 12MB CACHE SOCKET AM3+. APPROVED COOLING FAN FOR AMD PROCESSOR. The item “NEW AMD FX-4100 QUAD CORE X4 CPU 970 MOTHERBOARD 8GB DDR3 MEMORY RAM COMBO KIT” is in sale since Tuesday, August 28, 2012. This item is in the category “Computers/Tablets & Networking\Computer Components & Parts\Motherboard & CPU Combos”. The seller is “alvio-corp” and is located in Cleveland, Ohio. This item can be shipped worldwide.